beautiful thorns: Let Me Off! The Lord has truly blessed Tom and I with an amazing church community. There are so many good people at our church who love the Lord and desire to draw closer to him. If we had found a community like this 18 years ago, we never would have left the Catholic Church for ten years. One way we try to build community is to have what we call "Pasta and Praise" once a month. We rotate who hosts and then we have a simple meal, fellowship and worship. The last one we had was last Saturday and our theme was Pentecost. The Lord was very gracious to us and his Holy Spirit was so sweet and manifest in the house where we were worshiping! His presence was very tangible! While in worship an image came to my mind. 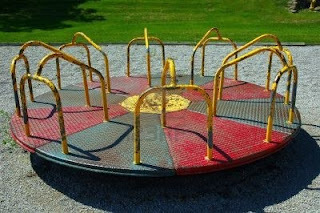 The image was of children on a park merry-go-round. I'm not sure if these are still around but I remember them from when I was a kid. You would get on and then hold on for dear life as another child would spin the merry-go-round as fast as they could. In my image the children were laughing and thoroughly enjoying this amusement. What came to me however is that an adult in the same situation would not necessarily enjoy it. Vertigo would set in and an adult might lose their lunch and want to get off. Life can often feel like a merry-go-round. When you are a kid you might enjoy the thrill but the older you get, the responsibility of life sets in and daily life can sometimes feel more like drudgery than fun. We can lose our sense of wonder, awe and excitement, especially if we have experienced suffering. The sense I had was the Lord wants to renew and restore a sense of wonder and the faith of a child. I don't think this just applied to our little group but something the Lord would like to do for all his people. Come Holy Spirit and renew the face of the earth!